If you're like me, the thought of introducing new products into your skincare regimen can be a little daunting ... because, with sensitive skin, you never really know what the result will be! Not so with StriVectin-SD for Sensitive Skin. This brand-new product is an antiaging powerhouse developed exclusively for sensitive skin, with none of the oils or fragrances that can cause irritation and leave sensitive skin vulnerable to accelerated aging. It contains a high concentration of powerful antiaging ingredients -- nicotinic acid (niacin), peptides, Swiss apple stem cells, resveratrol and garden sprout extract -- to fight fine lines, wrinkles, uneven skin tone and texture. And this week, one very lucky person will win a tube of StriVectin-SD for Sensitive Skin! This giveaway is valued at $79. Here's how to enter! 1) Leave a comment below, telling me why you'd love to win this giveaway. 2) Get an extra entry for liking The Beauty of Life on Facebook and leaving a comment on the wall that says: I want to win StriVectin-SD for Sensitive Skin! 3) Get an extra entry for following both me and StriVectin on Twitter and tweeting: Hey @BeautyChick101 and @StriVectin, I want to win StriVectin-SD for Sensitive Skin! This giveaway ends on Saturday, February 5 at midnight. One winner will be chosen AT RANDOM on Sunday, February 6. Maximum of THREE ENTRIES (one for each way listed above). For your entry on this blog, you must include your email address!! Multiple entries will be disqualified. Giveaway is open to US residents only. My skin is dry and sensative as is my GF's this would be a nice gift for her. It's never too early to start warding off the signs of aging, and this product would definitely help me do that. I have super sensitive skin. I love their eye cream so this would be a great addition to the skin care regimen. I would love to win this since I have sensitive skin and I am aging by the minute. This would make me feel younger! I had a sample of StriVectin and absolutely loved it. I would love to win a full size of this "miracle" product. Where I live its -30C today. I NEED a miracle skin cream!! I want to ward off aging without causing my skin to break out or react harshly. Can't tell you the number of times this has happened. I would love to win because this is such a high quality product and I have some fine lines and wrinkles that I believe this would help with. I My skin is horrible. I need a miracle skin cream. I'd like to win because I have sensitive skin, uneven skin tone and aging skin. I would love to win this because I have very sensitive skin and it's hard to find products I can use. The older I get, the worse my skin is getting. I still break out, and not just on my face. It is bizarre and ugly. I will start switching to sensitive skin products from now on - this would be a great start. I had a baby a year ago...needless to say, I need this product! I'd love to try this, because I too have sensitive skin & a drawer full of products that I can't use! Ithe only thing that has kept me from trying it is the fact that it's a bit pricey for my budget. I'd love to win this giveaway because StriVectin really works wonders :) *Thanks* for the giveaway! I've used Strivectin Products in the past and have been very satisfied with them ,so I'd very much like to try this one. My wife would love it and it would make her feel better. I'd like to win because I'm oily/sensitive and breakout prone. this sounds perfect for my skin type. Thanks. Besides having sensitive skin, I believe StriVectin would produce results. I would love to try Strivectin for sensitive skin, no more blotches for my sensitive complexion would be heavenly! I entered and liked on Face Book, and followed both you and Strivectin, and tweeted the message @BeautyChick101. Thank you for this great opportunity! I would love to win the strivectin for sensitive skin, bc I have VERY sensitive skin and finding skin care is always sucha challenge...please enter me to win! i need to get rid of these wrinkles. I would love to win because every product I try seems to make things worse. My skin is so sensitive, any little routine change makes my skin dry or break out. It would be great to have something that my skin can handle and that can help my uneven skin tone and stop those tiny lines! I would love to try this because my skin is very sensitive and I love that this is free of irritating ingredients! Thanks for the giveaway! I recently turned 41 and am concerned about the thinning skin around my eyes. I'm very sensitive to fragrances and some floral ingredients. I turned 40 at the end of 2010 and I have okay skin, but I'm always on the look out for a great product that has the latest science included. So I would love to win this and be able to try it. I'll keep my fingers crossed. As a redhead with fair skin and green eyes, who always burns in the sun and within 30 minutes of sun exposure,starts getting little red bumps on exposed skin, I am terrified of trying new products. I am very sensitive to fragrances and with just a little of the wrong scent, I could easily break out. However, there are all these anti aging products that I'd love to try and b/c of these sensitivities, I feel like I'm missing out. However, after reading about this product, it gives me some hope that I can use products that will do their job w/o me getting ill. And with the Strivectin name on the product, I know it's a product I can trust. I'm tired of spending so much money on a product, testing it once and never using it again. Winning the product in a giveaway is a wonderful opportunity to see how the product affects my skin before I start investing in this and other strivectin products. Thanks for this great opportunity. I do have sensitive skin and would love to try this to fight signs of aging. It sounds very nice. I would like to win this because I would like to look as young as possible for my son's wedding in December. I do not want to photoshopped out of the pictures for looking like a prune!And my son is capable of this, hehehe! I have heard very believable witnesses to the efficacy of this for sensitive skin, and am anxious to give it a chance to help erase my hard-earned life lines (wrinkles). Thanks for the chance to participate in this contest! I have sensitive skin AND I have some wrinkles—I NEED Strivectin! I'd love to win this because I have very sensitive skin. My skin is very sensitive so I cant use most products without breakouts.I would be so excited to find something to help with all the fine lines that are suddenly showing up on my face. I am a lotion and potion junkie so I would love to win. Thank you! I have super sensitive skin that makes it hard for me to find products that I can actually use. I would love to see if this would work for me and my skin. I'd like to win because I love StriVectin products. I have been drooling over this for a couple of months now. Now that I'm in my 30's the wrinkles are appearing, so I need an effective cream. I also have sensitive skin, so this would be perfect! I've always wanted to try their products. I'd like to try because less facial lines are more becoming!! I would really love to win this because I have very dried out sensitive skin and now that I am getting older, I want to start taking better care of my skin. I always heard this was good stuff would love to try it! Thank you for the great giveaway! I have used StriVectin-SD in the past and it's too harsh for my sensitive skin. 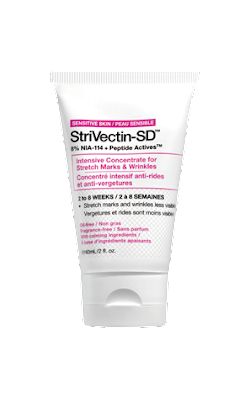 I would love to give StriVectin-SD for Sensitive Skin a try! I've tried StriVectin before and I really liked it. Would love to have another tube. I would love to try this on my skin. I would love to win this as the fine lines and wrinkles are taking over my face.